Submitted by Ladeda on April 13, 2009 - 11:24pm. Submitted by bakerchild on April 13, 2009 - 11:29pm. Yeah, I totally would have done that too....its a good idea! Submitted by Shelldragon on April 14, 2009 - 12:34am. Reminds me of my fiance.. so great with the computerin' but a complete fail at RL chores. He had a little freak out moment tonight as he tried to finish up taxes. Submitted by Xelmon on April 14, 2009 - 2:28am. ... Incredibly mature I must say. Where did he get the idea from anyways? Submitted by BradleyF81 on April 14, 2009 - 2:30am. This seems like something I would do, but for kicks, not because I thought it would work, especially if it were written out to someone I don't like, like a bad landlord or something. Of course, I haven't written a check in years. Everything is debit cards now. Submitted by Umegaki on April 14, 2009 - 2:47am. Submitted by cryxia on April 14, 2009 - 2:56am. thats why the correct answer to "does it have to.." is always yes. avoids strange situations like this.... however, asking the question is always fun, especially if you follow it up with "awwww, but...." if they say yes. Submitted by Kira on April 14, 2009 - 6:15am. Is that a?....... O.O Oh wow...... Well.... We all like to act like children sometimes.... Evil Trevor is funny. Submitted by Double_J on April 14, 2009 - 6:45am. Trevor and this guy would get a long real good. Submitted by duecetitan on April 14, 2009 - 6:51am. Submitted by Komitadjie on April 14, 2009 - 8:17am. Well, now I officially have to start using my check book again, just so I can do that. Submitted by Hadrian77x7 on April 14, 2009 - 8:53am. on a side note, loving your guest strip at GwS!! Submitted by kaitou on April 14, 2009 - 8:57am. Submitted by Peep_erz on April 14, 2009 - 9:21am. OMG he did NOT!!!!! LOL!!! Submitted by kaitco on April 14, 2009 - 10:26am. Submitted by Shanzi24 on April 14, 2009 - 2:03pm. Hah! I love that it's an old lady who is looking at the check. Amazing. Submitted by rath358 on April 14, 2009 - 2:53pm. Submitted by briannamal on April 14, 2009 - 4:19pm. Submitted by Cheshyr on April 14, 2009 - 4:39pm. Have you been talking the Gabe at Penny Arcade again? Submitted by Tenchi555 on April 14, 2009 - 5:06pm. 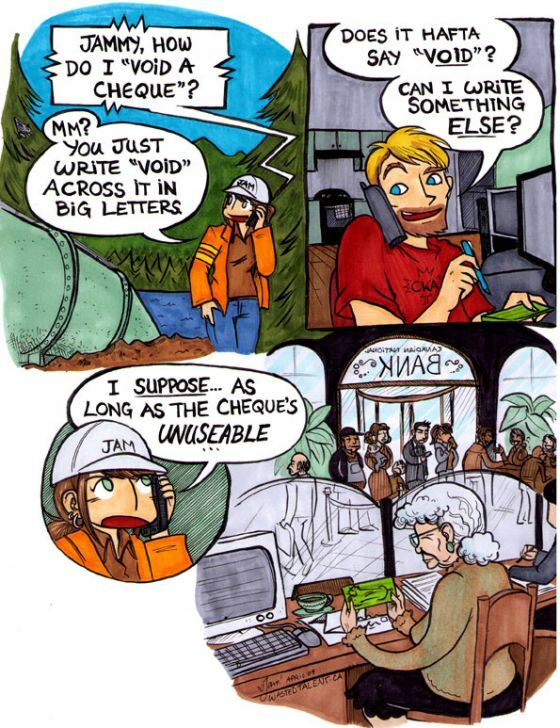 I don't know if the law has changed but last I heard writing "void" on a check doesn't actually make it void, but banks will usually not accept a check with that written on it. Though this may have been a law specific to the US and not one that applies to all banks. But I found it pretty interesting when I heard about it either way. Submitted by lengeta on April 14, 2009 - 10:59pm. Oh, us men, we're so clever, witty, and devious! Submitted by Ranorath on April 15, 2009 - 3:03am. Submitted by Findus on April 15, 2009 - 3:43am. Oh this comic is so great, Ive read it all today. NEVER STOP MAKING THEM or I will come and steal your shoes in the night. You will never see them again. Submitted by Sutokito on April 15, 2009 - 7:01am. She might be used to it. Submitted by sharidar on April 15, 2009 - 11:55pm. Submitted by Tomixcomics on April 16, 2009 - 5:28am. Submitted by BinaryDigit on April 17, 2009 - 3:19am. Submitted by brakoth on April 17, 2009 - 7:23am. Submitted by LstFllnANGL on April 17, 2009 - 3:20pm. Jam, you spell check funny =P. Also, I wanted to let you know: I feel your pain. Trevor and my "Bigs" should meet up, I'm sure they'd get along great. Submitted by omniwarrior on April 17, 2009 - 4:04pm.